The genus Helichrysum includes around 500 species from Europe, Asia, Africa and Australia. 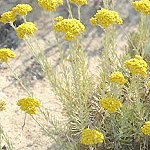 Helichrysum oil is produced on a limited scale by steam distillation or solvent extraction of the flowering tops of Italian everlasting, H. italicum, and closely related species. It has a rich, honeyed, herbaceous, sweet hay aroma and has been used for special effects in perfumery. 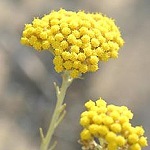 The major ingredient of typical Helichrysum oil is neryl acetate (up to 40 %). Moreover, a number of unusual beta-diketones are present in significant amounts, e.g. 4,6,9-trimethyldec-8-en-3,5-dione  . Etymology: The composite flowers of Helichrysums are surrounded by desiccated, coloured, membranous sepals, remaining unchanged when the plant is dried - whence the name 'everlasting'. Gr. helikhrysos, from Gr. helios, sun, and Gr. khrysos, gold, referring to the bright yellow colour of the flowers. This fragrant flower from Peru was introduced to European gardens in the middle of the eighteenth century. It is often seen in French parks being maintained in the old style. The sweet scent of the heliotrope flowers is commonly described as being vanilla-like, but it is 'lighter' and has a delicate caramel note. Although the heliotrope fragrance has always been admired in perfumery, extraction of the flowers has never been successful. 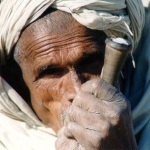 Knowledge of the constituents of the fragrance is also very limited. A Japanese study from 1995 identified benzaldehyde, anisaldehyde and benzyl acetate as major components, but these compounds alone don't explain the unique fragrance of the flowers . Etymology: Gr. helios, sun, and Gr. 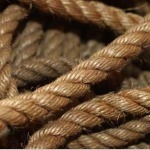 trope, turn. 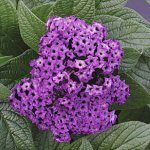 Many flowers follow the sun's movement, but not heliotrope! The name must arise from a confusion. P.S. The chemical compound 3,4-methylenedioxybenzaldehyde has been given the name 'heliotropin' because its odour somewhat resembles that of heliotrope. However, it is not found in this flower. and an important cultural plant - for its fibres and for its use as a drug. The seeds are nutritious and part of most bird-seed mixtures. 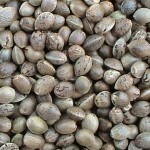 Hemp seed oil is a high-quality oil rich in essential fatty acids. Numerous cultivars or subspecies exist - from decided fibre types to decided drug types, the latter being selected for their content of delta-9-tetrahydrocannabinol (THC), the psychoactive compound in hemp. 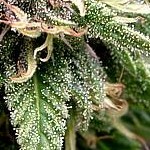 THC is almost exclusively located in the female flowering tops which may be heavily covered with glandular hairs, carrying a sticky, odoriferous resin (lower left photo). 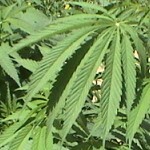 The "dark-green", herbal-fir-like odour of this resin is characteristic and also conspicuous in the smoke from hemp (hashish or marihuana). The hemp essential oil is related in composition to that of hop, with myrcene, ocimene, alpha-terpinolene, humulene and caryophyllene as some of the major constituents. Hashish detection dogs are trained on the smell of caryophyllene oxide, which is also present . In the daytime the honeysuckle flowers are almost odourless, but in the evening they become highly fragrant and are then pollinated by sphinx moths (Sphingidae) drinking nectar while they hover in front of the flowers like hummingbirds. The stunningly beautiful fragrance of the honeysuckle is almost impossible to describe - a powerful, lily-like aura diffused by vanilla-woody nuances. Cut flowers in a vase keep their daily rhythm. Headspace-GC-MS analysis of the fragrance of honeysuckle won't catch its magic, but several unusual odorants have been identified. For example, secondary metabolites of the amino acids valine, leucine, isoleucine and phenylalanine, i.e. oximes, nitriles and nitro-compounds, have been detected. 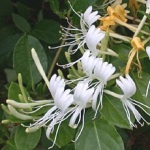 Although not responsible for the basic notes of the honeysuckle fragrance, they contribute to its special character. The terpene ocimene and the sesquiterpenes germacrene D and alpha-farnesene are major components as well as linalool. Moreover, a number of jasmonoid compounds are important for the honeysuckle fragrance, e.g. methyl jasmonate, epi-methyl jasmonate, jasmone and jasmin lactone. Eugenol and vanillin confer sweet undertones. (Z)-3-hexen-1-yl tiglate (not shown), also known from gardenia, is another character component     . Etymology: Lonicera, after the German physician and botanist Adam Lonitzer (1528-86); Lat. caprifolium, goat leaf, possibly from the old German name Geissblatt, as the leaves are said to be a goat's favorite; Gr. 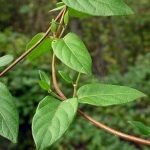 periklymenon, a twining plant.